Erik's car is a 2007 model finished in Galaxy Grey. As you can probably tell, it's not your average MX-5. 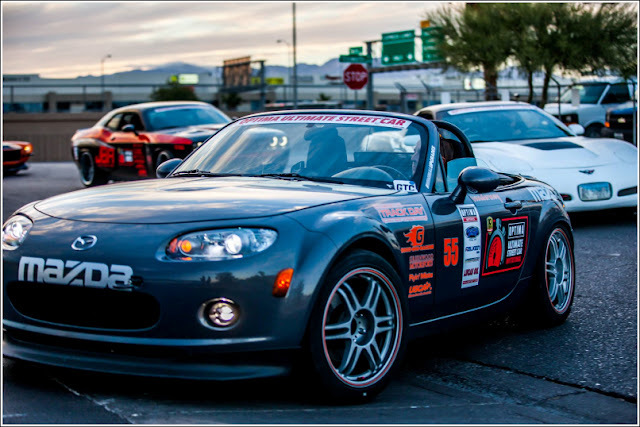 Erik's roadster has been extensively modified throughout and used to compete in the Optima Ultimate Street Car Series as well as various autocross and time trial events in the USA. Easily the most significant change is what lies under the bonnet. 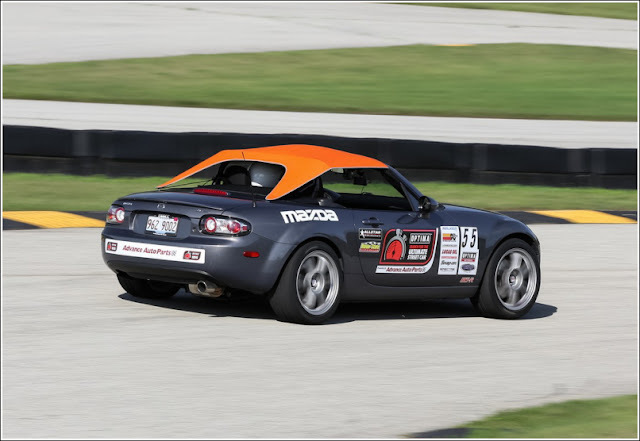 The standard 2.0 litre MZR engine has been swapped out for the larger displacement 2.5 litre version with the work done at Greenwood Motorsports & Wagons. 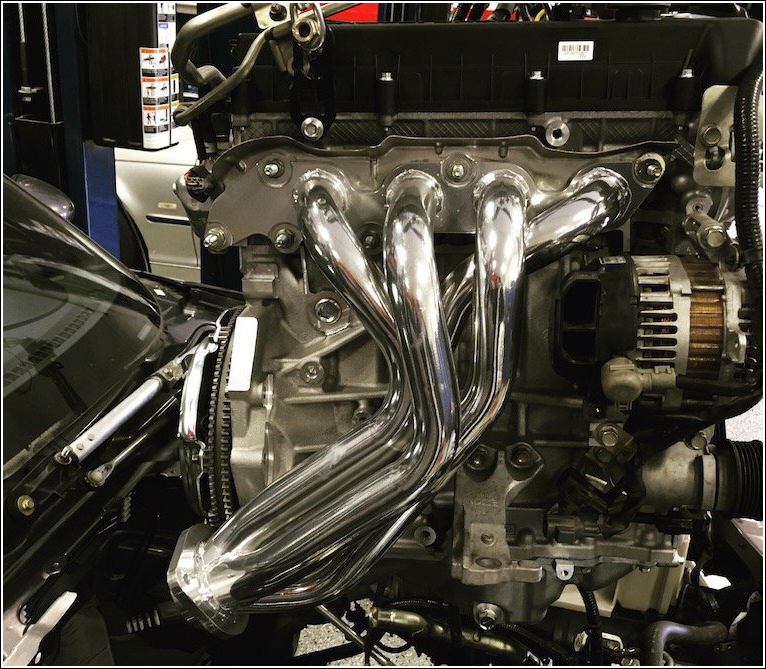 To help the car breathe there's a K&N performance air filter with custom cold air feed, and a completely new exhaust system from Goodwin Racing featuring a long tube ceramic coated exhaust header, midpipe with sports cat & resonator, and a roadster sport street single exit muffler. Moto-East were then responsible for tuning to get the most from the new powerplant. As we all know it's no good increasing power if you don't upgrade other areas to match. The boost in power is put through an uprated Exedy racing clutch together with lightweight flywheel. 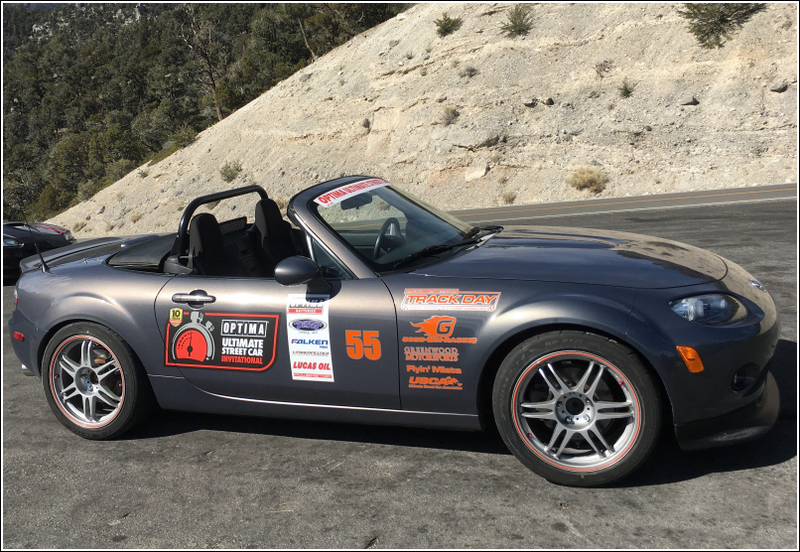 A set of wide 17x9 Kosei K1-TS alloy wheels with orange Rim-Pro-Tec system and 245/40/17 Bridgestone Potenza RE-71R tyres helps to put the power down. 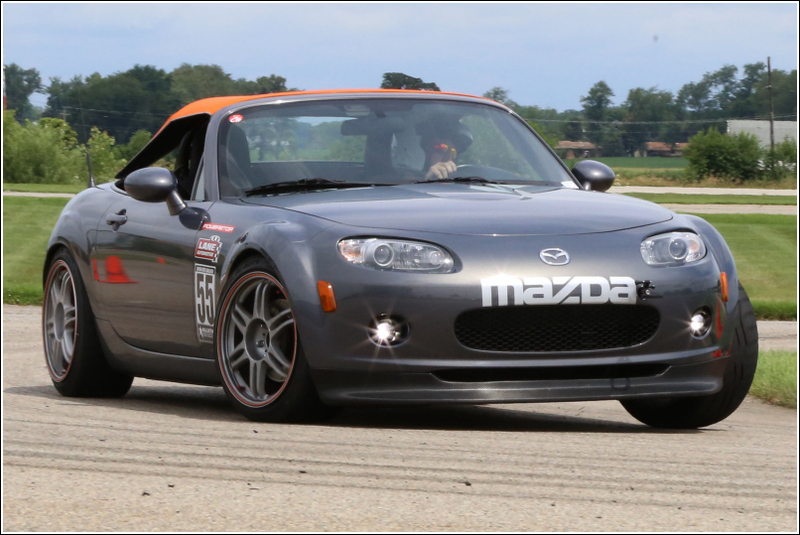 Finally a Mazdaspeed oil cooler and Goodwin Racing aluminium radiator keep temperatures down. 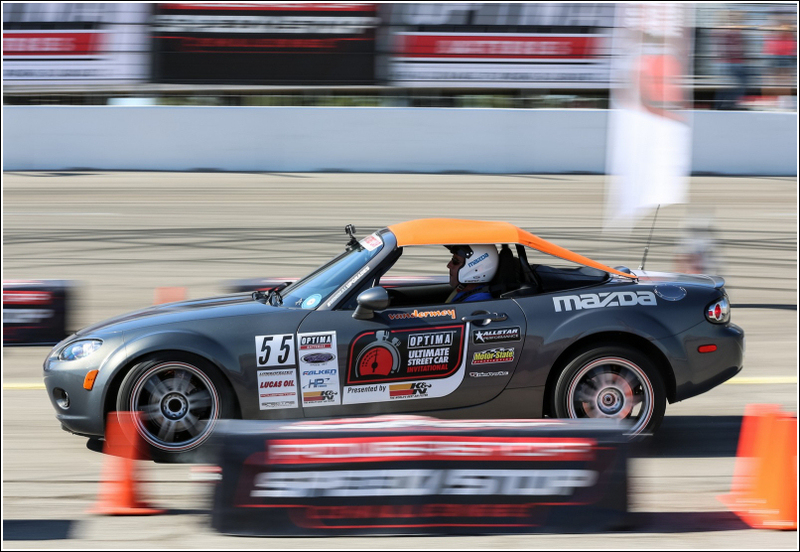 The car's handling and stopping power as well as acceleration is key to autocross events. With that in mind the standard suspension setup has been replaced with Ridetech TQ triple-adjustable coilovers, and stronger sway bars help to get body roll under control with a 27mm Mazdaspeed front and 21mm Hotchkis rear fitted. 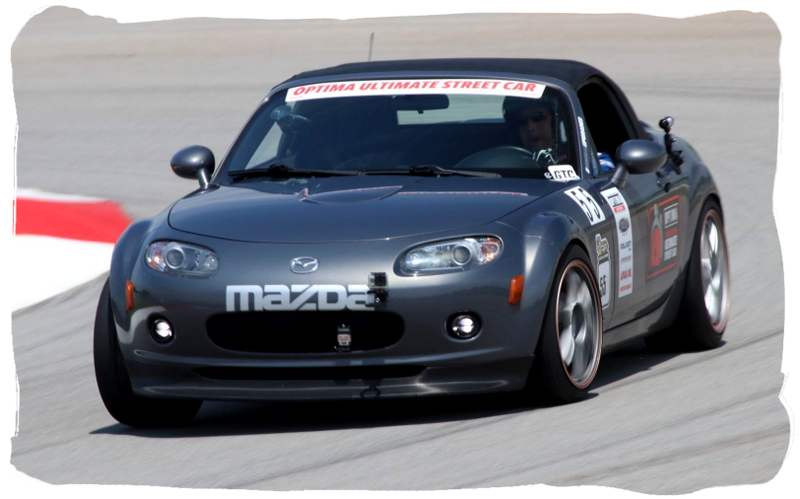 Handling is further improved thanks to the full set of Mazdaspeed chassis bracing. This consists of one large X-brace and two smaller braces that tie the chassis and rear subframe together for enhanced rigidity. The braking system is upgraded too with new discs and pads all round from Powerstop along with Goodridge stainless steel braided hoses. The exterior changes include front and rear lip spoilers from CarbonMiata, a chrome fuel flap, and LED upgrades to all lighting. The foglights have been replaced with LED daytime running lights giving the car a more modern look. The bikini-style roof was created from Hartz fabric by Riggs Brothers Auto Tops. It gives the car a unique look and reminds me of the the MX-5 Spyder concept seen at the 2011 SEMA show. Other changes include quilted leather floor mats, quilted leather trunk liner, and trunk lid liner all from CarbonMiata, a Blackbird Fabworx NC RZ Rollbar, a Pioneer AVH-1330NEX stereo, and an Optima Yellowtop battery. Overall a very nice, very capable car!